"Barack Obama", "Chamber of Commerce", "economic polic", "tax policy"
You might have heard of this by now. Republicans are heralding a crackpot study, funded by the Chamber of Commerce and other right wing groups, released by Ernst & Young, claiming that returning the top marginal rate for those making $250,000 or more in taxable income will cost 700,000 jobs! It assumes that the rich would rather make less money than make more money and pay a slightly higher percentage of it in taxes. It assumes that the effect of raising taxes on the least fortunate is approximately the same as raising taxes on the super rich. In fact, they assume that the rich are more tax sensitive. It assumes that businesses, especially "pass through" corporations with partnerships or sole proprietorships, would cease hiring if their taxes go up. This is classic supply side economics. This study uses an economic model that assumes that taxes exist in a vacuum, apart and separate from the economy and consumer activity, that the actions of individuals and businesses to invest and hire are based on taxes (either solely or primarily) and that the president has not proposed anything other than what is incorporated in their model. One key absurdity in the study is the claim that the rich are more susceptible negatively affect the economy from higher taxes than the poor. This makes no sense especially in a consumer economy like ours. Having to pay an additional 3-5 cents on taxable income over $250,000 won't stop anyone from buying anything they wanted to or otherwise planned to. More importantly, keeping their marginal tax rates 3-5 cents lower won't make them decide to buy more things. Note the comparative advantage of targeted federal programs for the needy, aid to states, and even targeted tax credits that President Obama has advocated and enacted for small business and middle class Americans. But the study really gets around to explaining this supposed greater susceptibility of the rich to higher taxes by the means of investment, rather than consumer spending. And there, it ran into more trouble. Let me demonstrate what I mean, For example, it is both common sense and an economic fact that business hiring does not depend primarily on their tax rates but on demand. If you have a business and no one has the money to buy your product, you aren't hiring someone even if your tax rate is zero. On the other hand, if business is booming, and you can't handle all the shipping and production with your current staff, you will hire new workers, regardless of whether your increased income results in a 3-cents-a-dollar higher marginal tax rate. There is no business owner dumb enough to sacrifice income because they'd have to pay a higher marginal tax rate. But for a moment, assume the insane notion tax policy is the only determinant of whether or not a business hires. So, increasing taxes on these high income earners ... err, "job creators"... would have a negative effect on jobs, right? Except that in proposing the American Jobs Act, the president included an idea - an idea that employers would earn tax credits for hiring new workers, and they would get even a higher credit if they hire the long term unemployed. In other words, the president's plan would reward job creation with its own tax breaks. 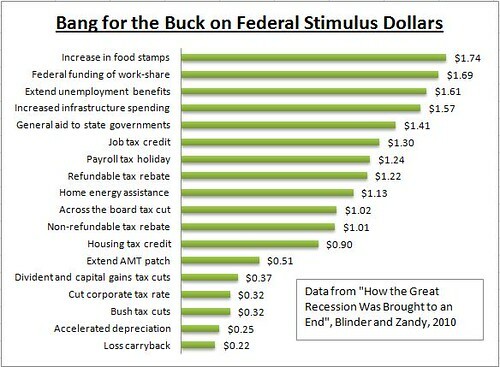 Every penny of extra taxes under Obama's plan could be earned back should these "job creators" actually create jobs. Somehow, the Chamber funded study neglects to incorporate that - or any other of the president's tax cut and tax credit proposals (such as making permanent the R&D tax credit, accelerated depreciation, credits to repatriate jobs moved overseas, huge tax credits enacted for small businesses to cover their employees with health insurance, and so on, and so forth). I'm sure it's all an oversight. Returning to the key absurdity of the study, absent also are the president's proposals geared to increase demand in our economy. The study purports to measure the effectiveness of "government spending" in lieu of the upper end tax cuts, but fails to account for the specific types of investments the president has called for. Firms choose the optimal level of labor and capital to maximize firm value. Investment in each sector is determined so as to equalize the after-tax return to investment. Firms will add to investment so long as the increase in firm value resulting from additional investment exceeds the after-tax cost of additional investment. In this way, investment is reallocated throughout the economy (i.e., across the four production sectors) until after-tax returns are equalized. What in the world are they talking about? What is equalizing "after-tax return to investment?" Let me simplify. Let's say you make $12 and after taxes, keep $10. You invest that $10 in a business. Your expected return must be at least $12 from that investment, since your actual cost of the $10 investment is $12. Following this theory, the higher the marginal tax rates for rich people (who supposedly do most of this investing), the lower their investment will be. If your after-tax income for that $12 is $11, for example, rather than $10, then you could invest up to $11 for the same expected $12 return. See, a whole 10% more investment! Except that it's 10% more investment with the same return! What's in it for the investor, then, and why isn't that static return, rather than the tax rate, the reason why investment would dry up? Crickets. The model fixes the expected return (not rate, the actual return) and only looks at the tax side. It is true that if you could expect no more than a $12 return from your investment - no matter what your investment was - then yes, the lower your taxes, the more likely you are to invest. In fact, according to this model, you could increase investment with a negative tax rate, i.e. by having tax dollars subsidize private investors, and I suspect that would be just fine with these folks. Completely absent from this model is the possibility of making $13, or $14 or more from your initial investment. How could you have that in a business? Oh, I don't know, maybe if there were more demand for that business' products or something. Demand generated by public investments in roads and bridges that would create jobs. Demand generated by graduates who have a smaller debt burden and thus smaller loan payments and thus more disposable income thanks to an expanded Pell grant program and cheaper federal student loans. Demand generated by more people who will be able to start their own businesses, because thanks to the Affordable Care Act, they won't be chained to a dead end job just for their health insurance. Demand generated by assistance to the unemployed and the needy. All of this demand, of course, would be made possible by asking the richest Americans to pay their fair share in taxes. This "study" is nothing more than a feckless exercise in supply side voodoo economics. It is not designed to give Americans a better understanding of economic policy - or even tax policy, for that matter. It is rather designed to give conservatives fodder to throw against President Obama. The claims of this Chamber-funded study are no more believable than the infamous testimony of tobacco executives that cigarettes weren't addictive.